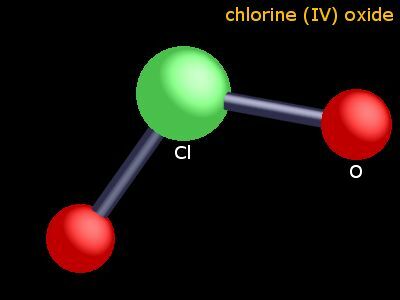 The oxidation number of chlorine in chlorine dioxide is 4. The table shows element percentages for ClO2 (chlorine dioxide). The chart below shows the calculated isotope pattern for the formula ClO2 with the most intense ion set to 100%. The data on these compounds pages are assembled and adapted from the primary literature and several other sources including the following. R.T. Sanderson in Chemical Periodicity, Reinhold, New York, USA, 1960. N.N. Greenwood and A. Earnshaw in Chemistry of the Elements, 2nd edition, Butterworth, UK, 1997. F.A. Cotton, G. Wilkinson, C.A. Murillo, and M. Bochmann, in Advanced Inorganic Chemistry, John Wiley & Sons, 1999. A.F. Trotman-Dickenson, (ed.) in Comprehensive Inorganic Chemistry, Pergamon, Oxford, UK, 1973. R.W.G. Wyckoff, in Crystal Structures, volume 1, Interscience, John Wiley & Sons, 1963. A.R.West in Basic solid state chemistry Chemistry, John Wiley & Sons, 1999. A.F. Wells in Structural inorganic chemistry, 4th edition, Oxford, UK, 1975. J.D.H. Donnay, (ed.) in Crystal data determinative tables, ACA monograph number 5, American Crystallographic Association, USA, 1963. D.R. Lide, (ed.) in Chemical Rubber Company handbook of chemistry and physics, CRC Press, Boca Raton, Florida, USA, 77th edition, 1996. J.W. Mellor in A comprehensive treatise on inorganic and theoretical chemistry, volumes 1-16, Longmans, London, UK, 1922-1937. J.E. Macintyre (ed.) in Dictionary of inorganic compounds, volumes 1-3, Chapman & Hall, London, UK, 1992.